Boil the lemon with water until soft & cut into small pieces. Heat oil in a pan, add mustard seed ,fenugreek , lemon & saute few mins. Add redchilli powder, turmeric powder & salt. Mix together until raw flavour extracts & rest it for 24 hrs. Wow! i get the original lemon pickle flavour while reading ur recipe. Good work! this method seems to be very easy. 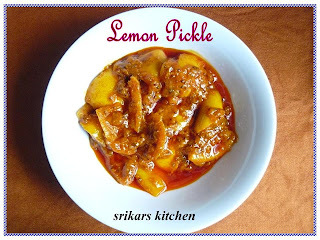 i have always failed to make a nice lemon pickle.. if i try next time, i will use this recipe. I have made a pickle similar and it is yummy! Lovely recipe. mmm. lovely pickle! looks so yummy! Instant pickles are always welcome. looks very easy.Never tried to make it.will try your recipe. Thats a gr8 colour.. Looks nice and spicy! Wow!!! !The lemon pickle looks so inviting. Lemon pickles always makes me feel nostalgic. pickle looks so yum priya,..nd wish u and ur family a very happy nd prosperous new yr,..